I received two 3770K today. One of them I am tempted to de-lid because I feel it should then reach 5Ghz +. Currently it it will do 4.8 with 1.28v (less with droop under load). I have been running prime95 small ffts this evening at those clocks without issue... aside from the temps that is. Load temps are ~90C on the hottest cores. I am using an NH D-14. 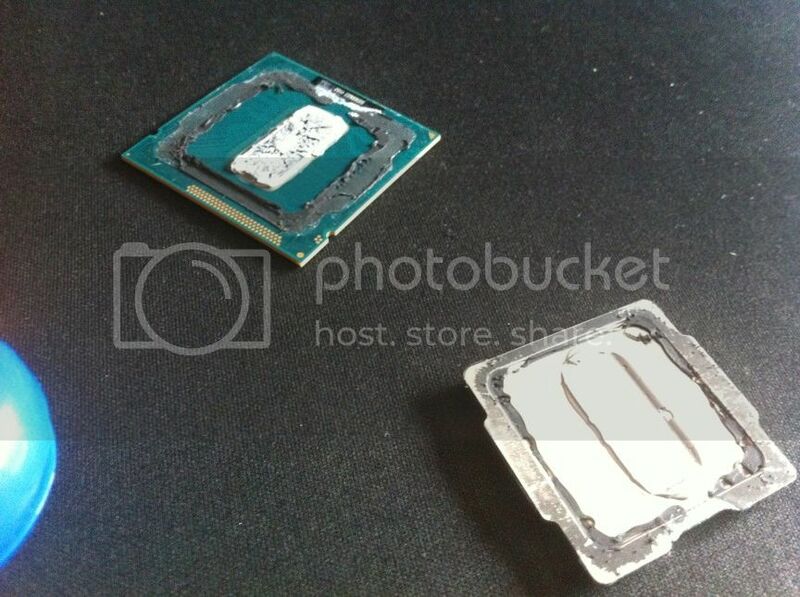 I would like to know how many of you who own 3770k (or 3570k) have chosen to de-lid and what your thoughts are? **I should mention the other 3770k will only do 4.6 with 1.28v. It runs cooler but does not like higher clocks even with added vcore up to 1.35v. Here's a good how-to if it helps. Haven't tried it myself yet though. From what I have read you can get good results, but you always run the risk of turning it into a lightweight brick. Is 200Mhz really worth the risk? Those things are over 300 smackers. When I get mine I plan to park it at about 4.5-4.6 for a dedicated gaming rig. Don't want to tempt fate. I feel that there is the possibility of clocking this chip over 5ghz if I could lower the temps by 20C. And ya, one does not remove the IHS for practical reasons, this is more of a hobby. That said I do not want to make a foolish decision and I was hoping to make up my mind after reading what other deliders said about the whole process. I used MX-2 to replace the dry and hard Intel TIM. I think with better TIM I could yet achieve cooler temps. As is load temps are down ~15C. Cool! It's been a while since we've had a series of procs that make it worthwhile for enthusiasts to remove the IHS. What are you cooling with and did you do anything different about how you mounted it? I am using a NH-D14. Ok, so it's not a naked proc, it's just got better tim on the IHS?